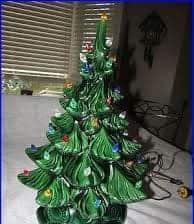 About 15 years ago my Mom gave me an old ceramic Christmas tree she had made in 1979. At the time, it was the only tree I had and I was excited to display this pretty old tree in my home. Over the years, I am ashamed to admit, it got a few chips and a few plastic bulbs had fallen out and been lost. I am even more ashamed to admit, it has been in a tote for the past 10 years! Truthfully, this is one of my many “guilty clutter” items I have taking up space in my home. I am holding onto it out of obligation/guilt, even though it isn’t my style and I will never actually use it. Every year, when I take out my Christmas decorations ,I feel a twinge of guilt as I look at that tired old ceramic tree. This year I decided to make a bold move….and paint it. I know what you are thinking. Are you crazy? 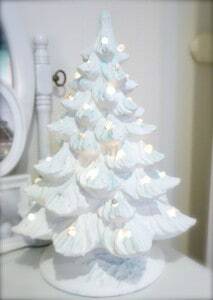 Your mother’s hand made tree? The truth is, I wasn’t honoring it by storing it under my stairs, never to be seen, so by making it fit into our home we are actually using it and enjoying it. I painstakingly removed all the plastic multi-coloured bulbs (with pilers and brute strength). Some went flying across the room and I’m pretty sure the dog ate them. Next I painted it white…with a brush. Sigh. If it had been summer, I would have spray painted it, but alas, low odour paint was necessary indoors. Finally, I sprinkled it with a dusting of aqua sparkles and glued on white and silver beads from my necklace making kit. Now it matches my girls room and makes a wonderful night light! They are so excited to have it in their room and they love the fact that their Nama made it years ago! So, while painting it was a bold move, in the end I am so happy I did. Now…here’s hoping my Mom doesn’t kill me!